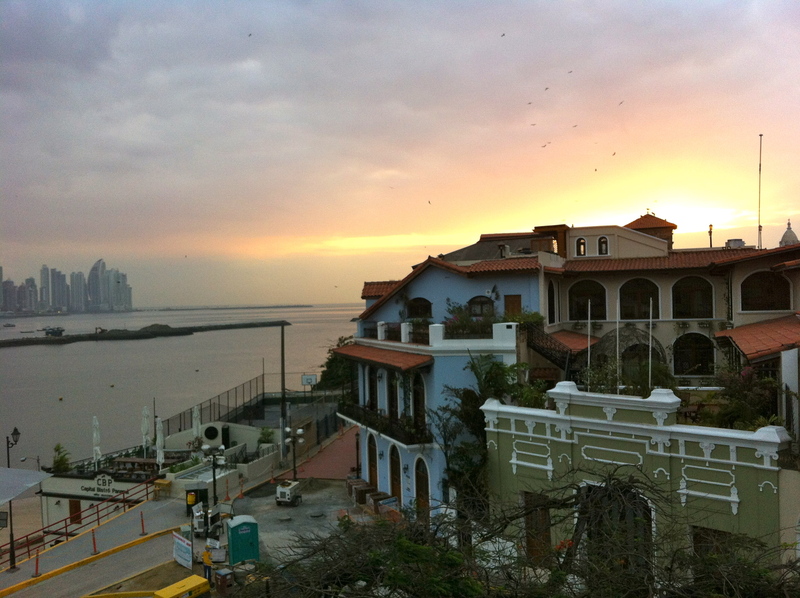 The next day, I awoke at sunrise and decided to take another walk around Casco Viejo. 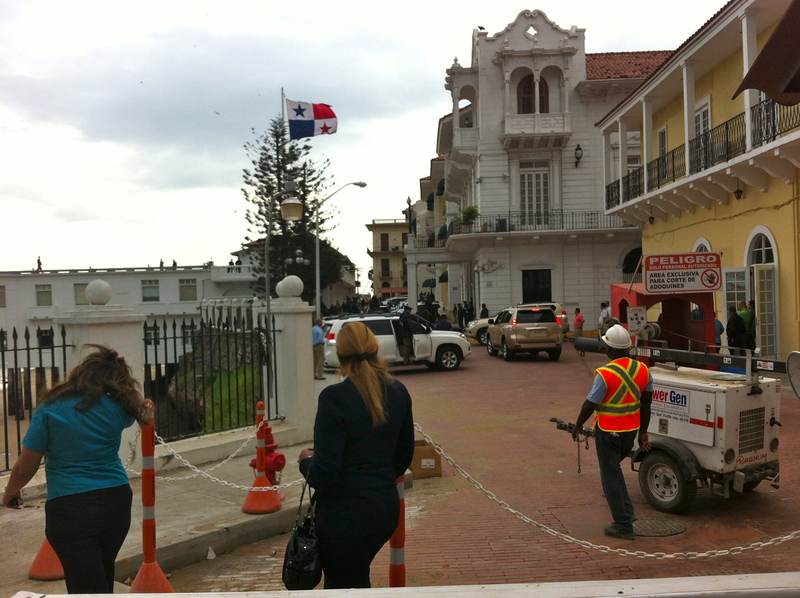 One of the most important buildings in Casco is the Palacio de las Garzas aka the Panamanian White House, which is located just two blocks from my hostel. When walking down one of the narrow streets near the residence, all of a sudden 2 motorcycles followed by 2 white Toyota Rav4s drove by. Because the streets were so narrow, they passed within 3 feet of me. I decided to wave to the people in the cars, but unfortunately did not get a wave back. I figured this was the less than impressive presidential motorcade, so I followed the cars to the Palacio. While I was not allowed to walk within a block of the house, I was able to see the president step out of one of the Rav4s and be greeted by four horsemen and a military band playing the national anthem. He then walked into the house. Staring confused at the security guard, he responded “cumpleaños”. I kind of crashed the birthday party of el president. After the event ended, I decided to chat with the military band. The President’s house from behind the checkpoint. As you can see, security in Panama is tight. One of my favorite parts of Luna’s Castle Hostel was the free pancakes every morning. At breakfast, I was able to meet fellow backpackers staying at the hostel. Basically everyone in the hostel, except for me, is a backpacker from Europe who has been traveling the “gringo trail” for 2-6 months. The “gringo trail” is nickname for the popular backpacking route through Central America. Most people start in either Mexico City or Belieze and end up in Panama. The trail ends in Panama because there are no roads through the Darien Gap into Colombia. So by the time a backpacker finally reaches Panama, they are tan, friendly, easygoing, and full of amazing and sometimes terrifying stories. These backpackers traveled as long as they could before running out of money. A day of rest didn’t mean much to them and after traveling for months, many people wanted to spend some lazy days at the end of the “gringo trail” before catching a flight back to Europe. If they woke up too late, oh well there’s always tomorrow. One German girl has been in the hostel for a week and has yet to do anything in Panama City! One day, I would love to be a backpacker like them. Panama is the end of the route for most people coming south from Belize or Mexico. However, unlike most backpackers, I was pressed for time since Spring Break is only a week. Therefore, I had an extra incentive to make each day count. If I went out late one night and got drunk, I would risk losing a day, which didn’t mean much to someone without a timetable, but meant almost 15% of the trip to me. 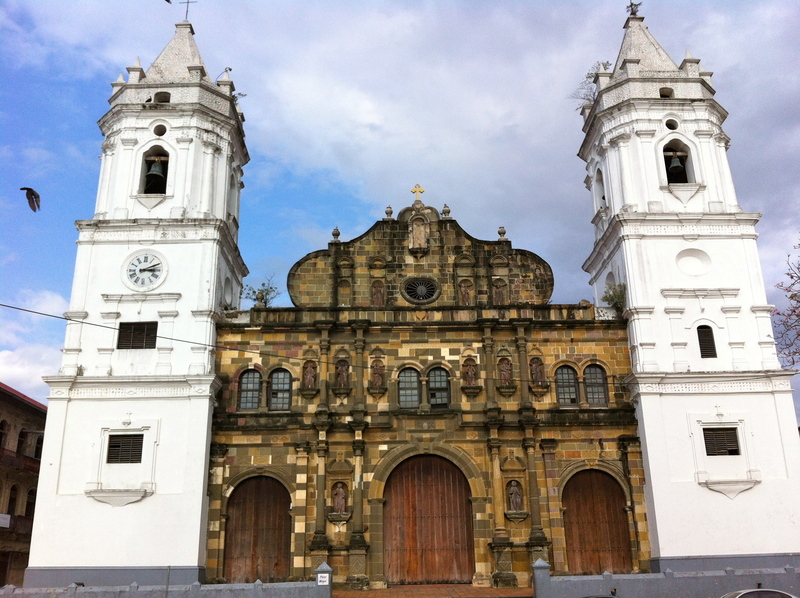 The Cathedral of Panama City in Casco Viejo. 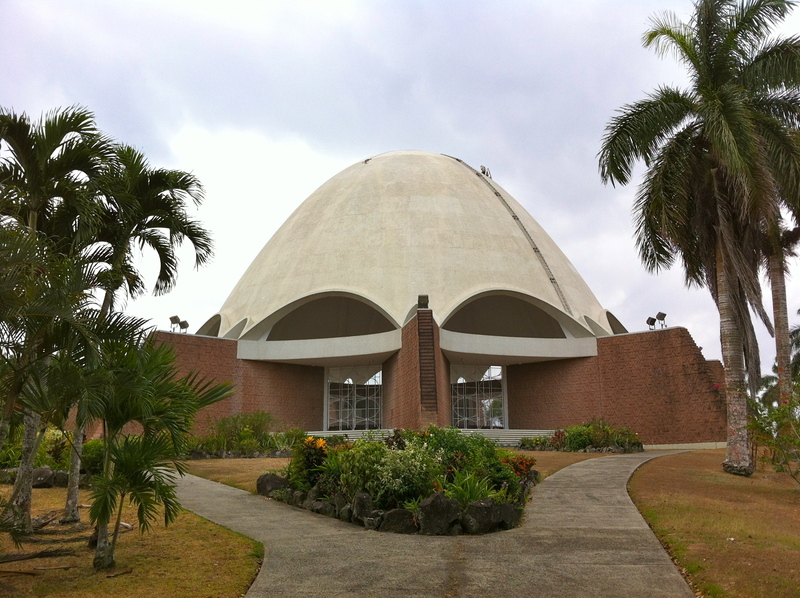 Panama City is home to one of 7 Baha’i temples in the world. Panama holds special significance in the Baha’i religion, as it is a gateway between continents, oceans, and cultures. The location for the temple is about 35 minutes outside the city by cab (I told him to return in 90 minutes). Just like all Baha’i sacred places, it is located at the top of a hill and is a 9-sided building. From the hill, you can view all of Panama City. While in pictures the Panamanian Baha’i temple is less than impressive, it seems to fit the landscape perfectly when viewed in person, which is admittedly a vague description, but I cannot think of anything better to say. After walking around the temple grounds, I had a discussion with the caretaker of the grounds, Abdiel. Abdiel offered me coffee and we proceeded to have an hour-long discussion about spirituality and the Baha’i faith’s place in world religions. Eventually, the cab driver returned at the scheduled time and returned me to the hostel just in time for lunch. About a 5 minute walk from the hostel is Café Coca Cola, a UNESCO World Heritage Site. 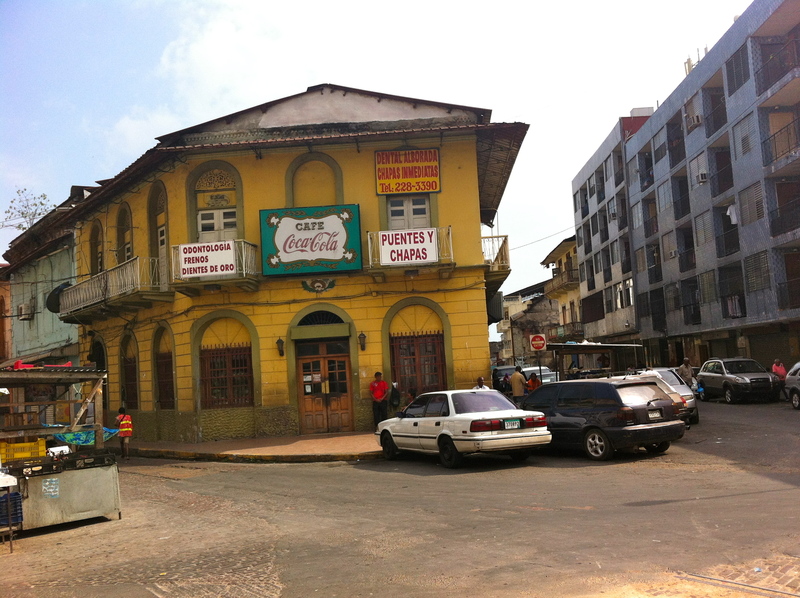 Turns out that Café Coca Cola is the oldest café in Panama (opening in 1875) and that Fidel Castro and Che Guevera planned their takeover of Cuba while eating lunch here. Everything about the place was no-nonsense from the food (mainly rice, beans and chicken but there were other options at very reasonable prices to the plainly dressed waitresses who refused to acknowledge the English menu. 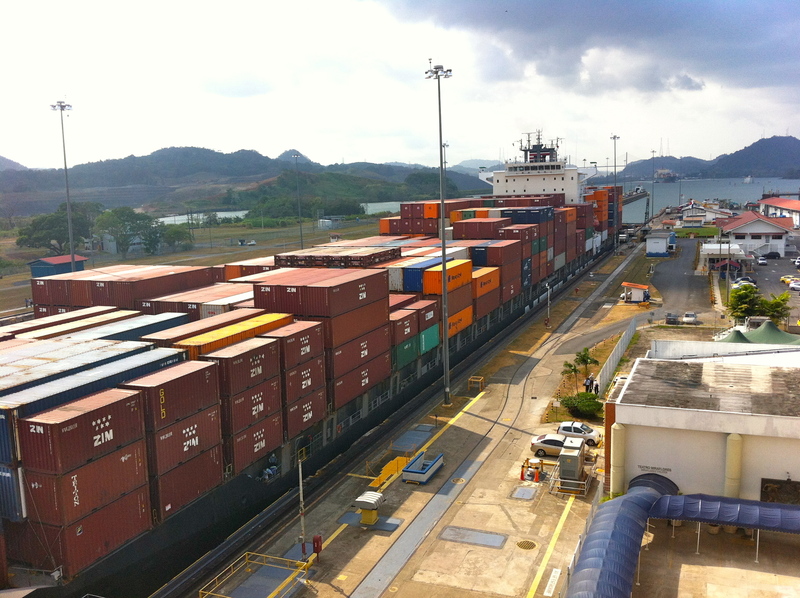 After lunch, I returned to the hostel and decided to go to the Panama Canal. A super tan British man named Adam who was staying in the hostel tagged along so we could split the expensive $6 cab. The Panama Canal cuts across the country starting in Panama City and ending 44 miles later in Colon, the second largest city in Panama. Along the way, there are 3 locks. The closest ones to Panama City are the Miraflores Locks, which are the largest of the 3. We got there around 3pm just in time to see a huge ocean liner pass through the lock. The enormous boat was just narrow enough to fit into the channel. As this was certainly the largest boat I have ever seen, I could only wonder how much stuff it was carrying and how much all the cargo was worth since it costs a few hundred thousand dollars to pass through the canal. Having seen the lock and dam system on the Mississippi River, I can truly say that I am in awe of the size and scale of the operation. Ocean liner in the Miraflores Locks, Panama Canal. I then went to dinner at Manolo Caracol, which would probably get a Michelin star or 2 if they rated Latin America. It was an elegant 9 course pre-fixe dinner for just $22… or so I thought. Turns out the guidebook in the hostel was terribly outdated and the dinner actually cost $50 including wine, which was actually reasonable for the quality of the food received. It was so good and so nicely presented that I took a picture of each of the 9 courses of food that night. Walking back, I passed by the President’s house and caught a glimpse of his birthday fiesta. People were salsa dancing on the roof. This would definitely not happen in the US. One cool part of my hostel, Luna’s Castle, was that the a bar in the basement. It was called the Relic Bar and was decorated like an old Spanish ruined fortress. Beers were 50 cents and the crowd was quite diverse, as both locals and backpackers come to the bar. I had a beer with a bearded man no older than 30. Turns out he was a ship captain looking for a crew to sail to Colombia (straight out of Pirates of the Caribbean). He told me about these islands called San Blas, which are in the Caribbean about a 30-minute boat ride from the Panamanian mainland. He said that these islands are the best place to visit in Panama, so we decided to book a trip leaving in 2 days.